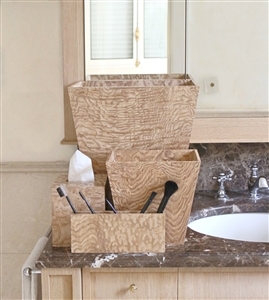 Our Luxury Bathroom Accessories Sets are so beautiful and luxurious without forgetting to be practical. iWoodesign offers a new dimension to Luxury Homeware. You can enjoy your home accessories on a daily basis and place them proudly on display to enhance your environment. An elegant Bathroom Set Dark Ebony. A gorgeous Luxury Bathroom Set in Warm Walnut. 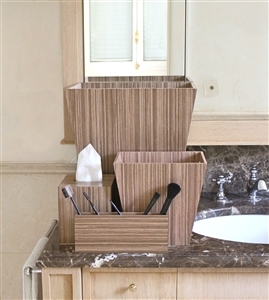 A contemporary Luxury Bathroom Set in Smoked Oak. An exquisite Luxury Bathroom Set in Japanese Tamo Ash. 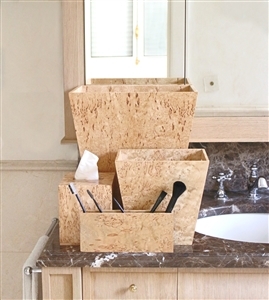 A stunning Luxury Bathroom Set in Russian Karelian Birch. 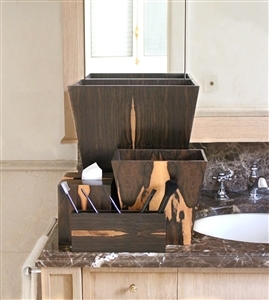 An incredible Luxury Bathroom Set in Mexican Ziricote.